Grow upwards in your garden and let your imagination run wild! Create your very own Green Living Wall! Bring out your inner designer with this ingenious solution to make the most of your available space. Instant coverage and impact and simple to use on walls, sheds, houses or fences. Watering is easy and creating perfect growing environment - each layer drains into one below. Plant them up direct with bedding, bulbs or even strawberries, herbs or tumbling tomatoes, or drop in 12cm (4.75') pots of plants. Each single, 3-pot section measures 46cm long x 18cm tall x 19cm wide. 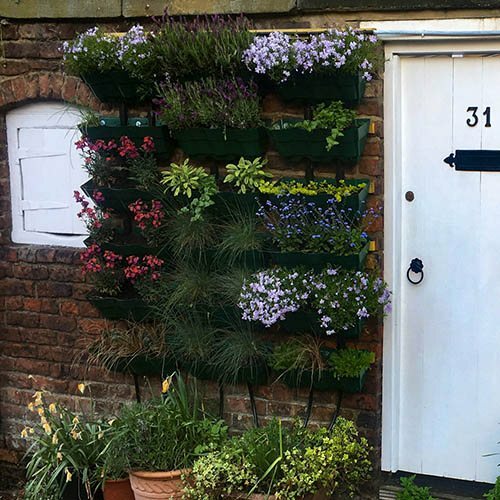 Vertical Gardening, using spaces and walls you can’t grow on, is bang on trend at the moment and is a popular feature with garden designers. This living wall garden kit is a self-watering, vertical garden wall planter. So easy to use, and to fix on walls, you can grow almost anything in them - your designs are only limited by your imagination. Perfect for covering unsightly walls and buildings, or using space on sheds, buildings or fences, the system is easy to use and create, as each tier stacks offset on the on below, quickly building up to cover a large area. Each tier has a drainage hole, which allows excess water to drain to the tier below yet keep enough water in a reservoir of its own to keep roots constantly damp - so you don't need to be constantly watering. You can even rig up an irrigation hose above the top tier to keep the whole system watered. 2. Drop in pots of flowers or foliage as you like for 100% effective immediate results - no waiting for it to grow - the system has been designed to accommodate pots up to 12cm in size. 1 Planter consists of 3 sections. 1 section for 3 pots, 46cm long x 18cm tall x 19cm wide.